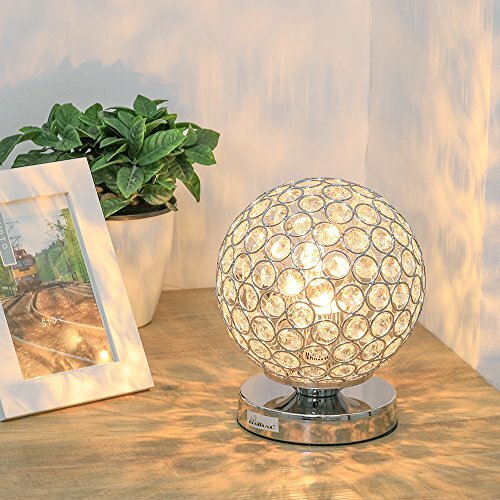 Built with a sturdy metal frame & base, the lamp shade is made of K9 sparkling crystal beads, with high clarity and adopt eight-sided cutting technology to make it more sparking under lighting like jewellery. It will be a nice home decorations or gift for thanksgiving,new year,weddings,parties or other special events. (1) After receiving this modern lamp, please pull out the lampshade from the base (please note that the hand should not be injured by the spring force). (2) Please install the E26 light Bulb, Max 60W. ✄✄ IDEAL GIFTS & 100% WARRANTY GUARANTEE - This bedside lamp is a ideal gift or home decor for mom, wife, friends. We provide 30-day money back, 2-year warranty, If you have any question with this night lamp, please contact us.